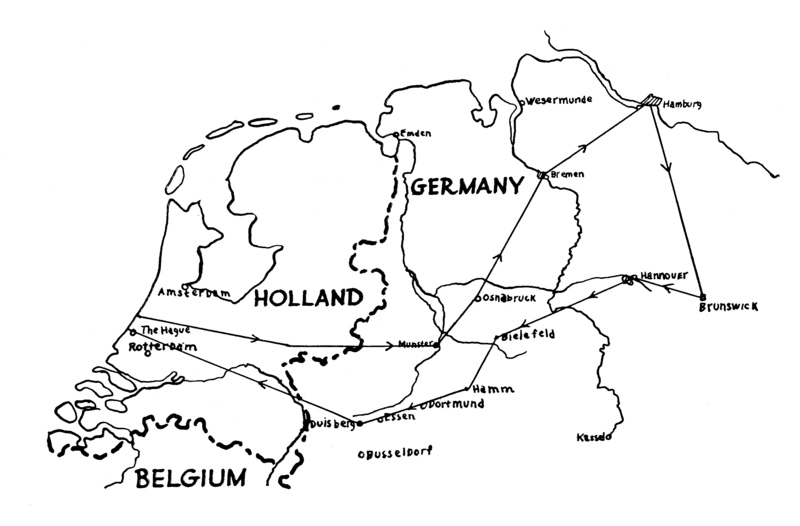 There were two flight routes for the Trolley Mission over Germany between 7 May 1945 and 12 May 1945: The Northern flight route and the Southern flight route. Because the army of the Soviet Union conquered the eastern part of Germany, the Trolley Mission routes principally covered the western part of Germany. The two flight routes were depending on the weather conditions. Both routes lead all along the Rhine river. During the Northern flight route the pilots crossed the Rhine river near Arnhem. Then they flow to the city of Münster, Osnabrück and Bremen. After that, they flew over the big city of Hamburg and its harbor and shipyards. Thereafter they were flying to Brunswick and Salzgitter, near the so-called “Hermann Göring Steel Works”. Later on they flew over the city of Hannover, Bielefeld, Hamm, Dortmund and Duisburg even on the northern flight route were no landings. And, on German territory the pilots were flying under visual flight rules.